Expect westbound single-lane closures throughout the project work zone, and at the westbound Exit 128 on-ramp. Expect traffic control April 22-24 at the Shoshone Exit. This section of I-70 experiences a range of weather conditions throughout the year, causing unsafe conditions for drivers who don't take proper precautions. Based on a recent safety assessment by CDOT, this area sees a high number of crashes involving fixed objects, especially during inclement weather. 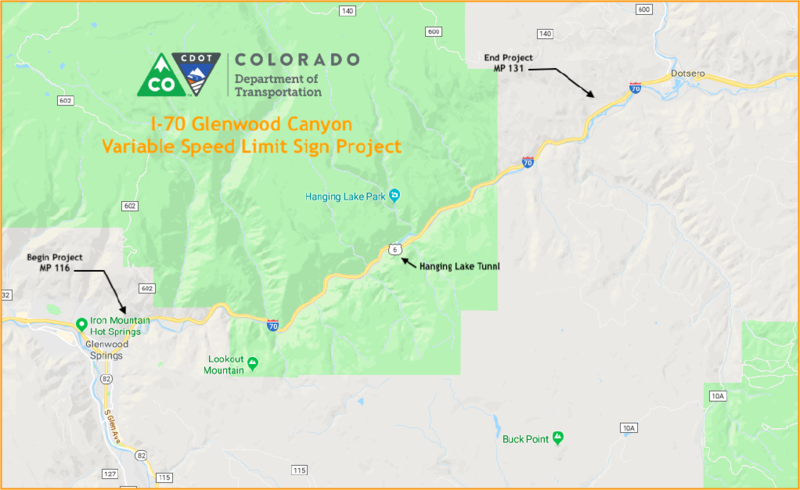 In March 2019, following a winter shutdown, crews resumed work to install variable speed limit (VSL) signs on I-70 in the Glenwood Canyon corridor. 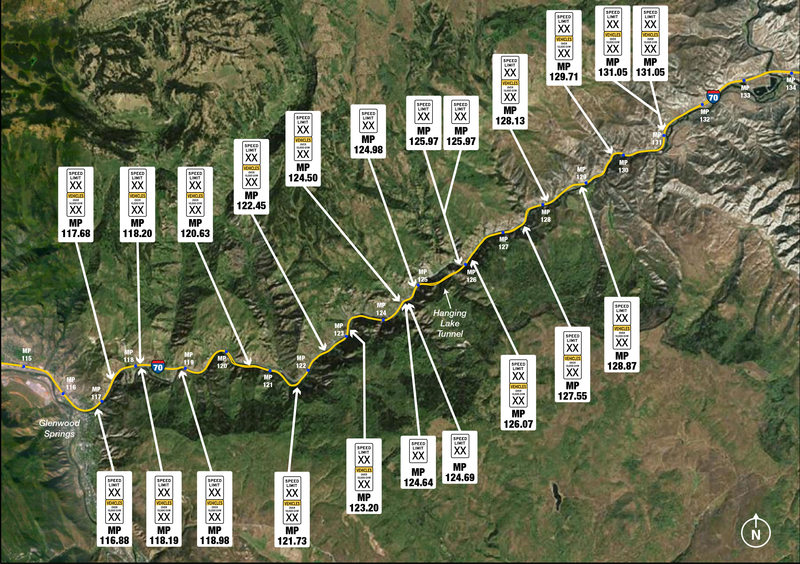 The project—on I-70 east of Glenwood Springs, from mile points (MP) 116 to 132, will incorporate technology to monitor weather and traffic conditions, and control speed limits where needed. adding other surface and subsurface conduit, and related improvements to guide the display of the variable speed limits. These improvements give drivers advance warning and generate a safer traffic flow to decrease accidents in the canyon. Improvements increase the standard speed limit during good conditions to 60 mph for passenger vehicles, and 50 mph for heavy vehicles (over 26,000 gross vehicle weight) in most areas of the canyon. The technology—operated by people and the technology itself—will lower the speed limit to assist with incident management, conditions created by inclement weather, and maintenance and construction. In 2018, crews excavated, trenched, performed directional boring, installed barrier conduit, micro pile, micro pile foundation caps, placed sign foundations, seeded and performed erosion control. All work done was in preparation for spring 2019 VSL installation. Give drivers advance warning and generate a safer traffic flow to decrease accidents in the canyon. Increase the standard speed limit during good conditions to 60 mph compared to 50 mph in most areas of the canyon. Lower the speed limit to assist with incident management, conditions created by inclement weather, and maintenance and construction. CDOT prepared a categorical exclusion under the National Environmental Policy Act (NEPA) to understand and minimize the environmental impacts of this project. As part of that process, CDOT conducted a visual impact assessment. Please contact Michael Curtis with project questions.